200 human calcaneum dried bones obtained from Department of Anatomy & Department of Forensic Medicine of Indira Gandhi Institute of Medical Science, Patna; Vardhman Institute of Medical Sciences, Pawapuri; Nalanda & Darbhanga Medical College, Laheriasarai; and also from undergraduate students. For intra-articular fractures the calcaneum impacts the ground and a primary fracture line develops and runs from plantar-medial to dorso-lateral. Comparison of BMD at calcaneum in Indian children (37) with data from healthy Caucasian children in the United Kingdom acquired with the same model of densitometer (34) showed that LSES subjects had lower values and USES subjects had higher values. The belly and its tendon passed between gastrocnemius and the soleus muscles from lateral to medial side and fused with the crural fascia just above the calcaneum. Material: tibia, fibula, astragulus, calcaneum, tarsals, metatarsals, vertebrae, three ribs, and part of a scapula (UMMP 37169) collected in 1872 by Orman Tuttle and donated to UMMP in 1960. At least three metatarsals and probably the astragalus and calcaneum are present, although they are not preserved in their original position. As the calcaneum everts markedly during weight bearing, the lateral border of the foot becomes shorter than the medial border, which is increased due to the protruding head of the talus medially (13). The retrocalcaneal bursa is located between the Achilles tendon insertion and posterior part of the calcaneum. 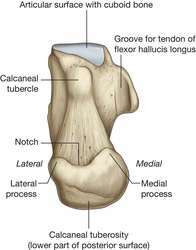 23) On the other hand, the height of the scaphoid tuberosity is considered to be a good indicator of pronosupination of the foot, since the changes in scaphoid height are related to positional changes of the calcaneum, subastragaline joint, and the mediotarsian joint. Likewise soft tissue release with medial open wedge osteotomy of calcaneum and insertion of bone wedge is also described.